Phone sets at fire stations are not working, vehicles are lying idle for the past many years, ambulances are in bad shape, there is leakage in buildings and rainwater enters these buildings. These are among the anomalies pointed out in an inspection report submitted recently by the fire and emergency committee. A 12-year-old student of a government school in Devinagar here was allegedly beaten up brutally by his schoolteacher, resulting in a fracture in his right arm. The student, a resident of Nada Sahib, has been admitted to the General Hospital, Sector 6, Panchkula. Who let the cattle out? Nearly a month after the face-off between Deputy Commissioner Mohammed Shayin and the then Subdivisional Magistrate, Amandeep Kaur, two employees of the Chandigarh branch of the Indian Red Cross Society have been dismissed from service. A man suffered 20 per cent burns today after he came in contact with a high-tension wire hanging loosely from an electricity pole in Sector 4, Panchkula. The victim, Harmahinder Singh, a businessman, was taken to the General Hospital in Sector 6, Panchkula, from where he was referred to the PGI. 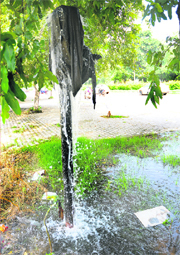 Mohali MC office outside municipal limits! The Mohali Municipal Corporation, which is trying hard to extend its limits, has its office outside the municipal limits of the town. The MC building, which houses the office of the MC Commissioner, the Joint Commissioner and other staff, is located in Sector 68 and the entire sector does not fall in the MC limits. 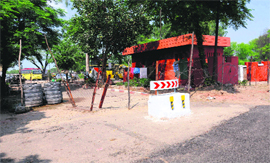 Commuters taking the Dhanas-Mullanpur road face a lot of inconvenience at the Mullanpur barrier as a major portion of the road has been encroached upon by the CRPF. The CRPF personnel have built rooms and washrooms encroaching on the road. This CRPF post has been there for around past three decades. The resident doctors at the PGIMER have called off their strike as the authorities have now assured them that a police post will be set up at the Emergency for the security of the doctors. Former UT Superintendent of Police (City) Deshraj Singh, who is facing corruption charges, today procured documents pertaining to the chargesheet filed against him. He had filed an application before special CBI court judge Vimal Kumar for providing him some documents pertaining to the chargesheet filed against him. Deshraj pleaded that some of the documents provided to him earlier were not legible. It's not for the first time Sub-Inspector (SI) Harinder Singh Sekhon has courted a controversy. Sekhon, who has been sent to the Police Lines for his alleged involvement in a brawl outside a discotheque in Sector 35 over a month ago, was put under suspension in August, 2008, for his alleged involvement in a high-profile drug-peddling racket in the city. 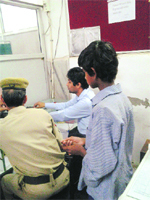 Despite instructions from the senior officials of the Chandigarh Housing Board (CHB) not to ask the beneficiaries of the Small Flat Scheme 2006 for an NOC from the Electricity Department, the officials manning the public counters at a special camp being held at the CHB office are still insisting for the document. While the MC is all set to spend Rs 15 lakh on the ‘wasteful’ study tour of 20 councillors and five officials in Kerala and Tamil Nadu on September 18, the families of those who died in accidents involving stray cattle state that such tours are not study tours but leisure and pleasure tours. 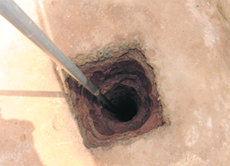 Last week's incident involving a two-and-a-half-year-old boy who fell into a 15-foot-deep cemented pit at the ITBP flat construction site in Sector 32 seems to have taught no lessons to the UT Administration. Farmers’ protest snarled up the traffic for the second consecutive day in Panchkula as around 2,000 farmers from across the state tried to lay siege to the Vidhan Sabha this afternoon. Four hundred units of blood were collected during a camp organised at the Sector 22 community centre today. The camp, organised by Competent Foundation, was inaugurated by former Punjab minister BD Tandon. Sanjay Tandon, president of the state unit of Bharatiya Janata Party, who was celebrating his fiftieth birthday, thanked all the donors. The Northern Railways is introducing a new train on the Ambala-Delhi route to ply daily from September 14. On the inaugural day, the Ambala Cantonment-Delhi junction train (No. 14522) will depart from the Ambala station at 11.25 am and reach the National Capital at 5.20 pm. The High Commissioner of Rwanda to India, Ernest Rwanucyo, was in the city on Tuesday to meet the Rotary Club of Chandigarh members. At a press conference, he expressed his gratitude to the Rotary Club for “building bridges of friendship and goodwill” through the Rotary Heartline Project. The newly elected Panjab University Campus Student Council (PUCSC) president, Chandan Rana, was given a clean chit by the university authorities with regard to the complaints of rigging and Lyngdoh violations against him. 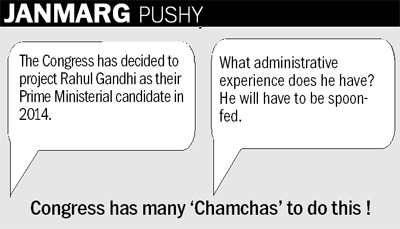 The candidate playing safe during the inquiry claimed to have contested the elections independently, following which the allegations of Lyngdoh violations could not be proved against him. Students who were sitting on an indefinite fast against alleged violations of the Lyngdoh recommendations called off their protest late this night. 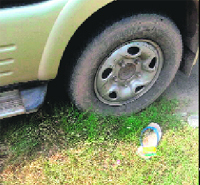 The Vice-Chancellor reportedly offered juice to the students, but they refused to accept it. Tension between NSUI supporters and different student parties, who had complained of rigging during the recently held student elections, kept the police and the university authorities on their toes during the elections to five executive committee members elected among the department representatives (DRs). Mohali: Yadavindra Public School won the trophy for the 'Best International Delegation' at the prestigious Aitchison College Model United Nations Conference-V held at Aitchison College, Lahore, Pakistan. The conference was held from September 5 to 8. The team comprising nine members was accompanied by school principal RP Devgan. Jasveen Bhinder acted as the faculty advisor of the team. Panjab University (PU) today hosted a technical meet on the ‘Role of Chemical Engineers in Defence Sector’. The meet was organised by Dr SS Bhatnagar from the University Institute of Chemical Engineering and Technology (SSB UICET), under the “Technical Education Quality Improvement Programme’’ (TEQIP-II). The Department of Computer Science organised a seminar on diverse technologies in the area of information technology today. During the seminar, the speakers from the IT firm HCL shared their vision with students on the issue. They enlightened the students about the challenges being faced and the latest trends in IT industry. With ‘Young Malang’, an upcoming Punjabi movie, the Punjabi film industry gets its first ever fashionable and style statement laced movie with cinematography unseen in the industry. This was stated by Rahulinder Singh Sidhu, the producer and creative director of the multi-starrer movie. The three-day theatre festival being organised by the Department of Theatre and Television began at Punjabi University here today under the guidance of head of department Dr Sunita Dhir. The BAM Khalsa College, Garhshankar, today outclassed Post Graduate Government College (PGGC), Sector 11, 3-0 in the ongoing Inter-College Football Championship for Men (A-Division) being held at the soccer grounds of Panjab University. The water polo team of SGGS College, Sector 26, lifted the title of the Panjab University Inter-College Water Polo Championship for men for this session. The championship concluded this evening at the swimming pool of Panjab University.